Gerard David was an important Netherlandish painter of the late 15th and early 16th centuries whose most important contribution was his role in the development of landscape, in which he helped to establish the ground rules of a tradition that would culminate in Joachim Patinir. David’s work reveals the influence of the great Flemish masters such as Jan van Eyck, Rogier van der Weyden and Robert Campin, among others. 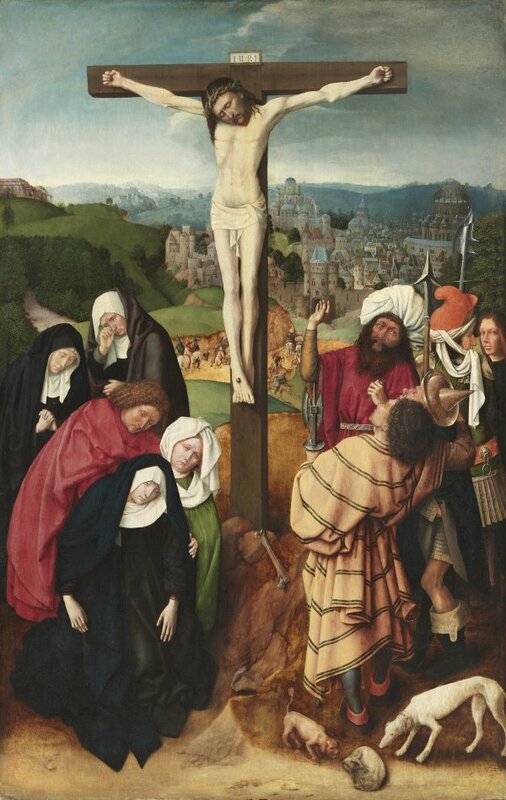 The present Crucifixion is considered an early work by the artist. The dead Christ on the cross forms the central element within the composition, dividing it into two parts. Notable on the left is the group of the Virgin, Saint John and the Magdalen, which is organised through diagonal lines and which looks back to the work of Flemish painters of the previous generation. Stylistic parallels with the work of Campin have been detected in the group of spectators on the right, for example, the figure in the foreground wearing brightly coloured, striped clothes. The acidic colours such as the orange, green and yellow are typical of David’s style and in general of the work of northern Netherlandish artists. The way in which the narrative is structured has been compared to a miniature in the Book of Hours of Catherine of Cleves now in the Pierpont Morgan Library, New York. The first recorded information relating to Gerard David dates from 1484 when the painter is documented in Bruges. It is known that David was born in the northern Low Countries in Oudewater but we have no information regarding his training. He may have studied in the circles of artists such as Albert van Ouwater and Geertgen tot Sint Jans. It has also been suggested that during his period of training he was in contact with Dirk Bouts’ studio in Louvain shortly before David moved to Bruges but after Bouts’ death. The only documented paintings by the artist are the panels of the Judgement of Cambyses of 1498 in the Groeningenmuseum, Bruges, and the Virgo inter Virginesof 1509 in the Musée des Beaux-Arts, Rouen. In the latter the artist portrayed himself together with his wife at the left and right edges of this large composition. David and his wife donated the panel to the Carmelite convent of Sion in Bruges. The present panel of the Crucifixion was formerly in the Augustinian monastery of Saint Florian near the city of Linz. The monastery also housed a series of paintings by Altdorfer. It was subsequently in the hands of the Paul Cassirer gallery in Berlin and entered the Thyssen collection at the Villa Favorita in 1928. The panel seems to have been on loan the Kunsthistorisches Museum in Vienna during the time it belonged to the monastery of Saint Florian. The painting has been much debated regarding its chronology within David’s oeuvre, and has been placed in his earliest phase, around 1475. Christ on the cross, his body set slightly off-centre, marks the central axis of the composition, which is arranged with the two traditional groups below the cross. Christ’s torso, the position of his legs and the way his body is painted, are based on traditional Flemish models and are rather archaic for a work of this date. David’s presentation of Christ avoids the most physically dramatic moments of the Passion, evident in the lack of emphasis on the wounds in the thigh, hands and feet. On the left the composition is organized using pronounced diagonals along which the figures are arranged, recalling the practice of earlier Flemish painters such as Rogier van der Weyden, particularly the group with the Virgin, Saint John and the Magdalen. The influence of Robert Campin has been suggested with regard to the figures on the right, given that Campin used brightly coloured, striped clothing such as we see on the figure in the foreground. The organisation of the composition has been related to a miniature in Catherine of Cleves’ Book of Hours in the Pierpoint Morgan Library, New York, dated around 1440, which has two figures identical to the present one in the striped tunic and the one standing next to him. While various artists influenced the young Gerard David in the organisation of the figures in this composition, the artist also included elements that would become characteristic of his particular style. These include the use of acid orange, green and yellow tones, typical of artists from the northern Low Countries.